If there was any justice in the world of film distribution, the new English language post-apocalyptic climate change thriller “Snowpiercer” by Korean director Bong Joon-ho would be taking the world’s box office by storm. It’s a stunning film, technically brilliant, hilarious in parts and fabulously designed, paced and directed. It’s torn from tomorrow’s headlines, and shamelessly borrows from numerous recent films such as “The Hunger Games” series, “The Road” (which still gives me nightmares five years later), “The Day After Tomorrow” (global cooling), “Divergent” and “Elysium”. Instead, despite a 95% positive critics’ rating on Rotten Tomatoes, excellent acting turns by John Hurt, Tilda Swinton and from Chris Evans (“Captain America”) in the heroic lead, it is only playing in a handful of cinemas here in Australia (just two in Sydney, by last count) – with an Australian box office gross of about Aus$100,000. As of yesterday, it was only in 100 cinemas in North America, where it has grossed a paltry US$4,213,337. By contrast, the film has pulled in some US$60million in South Korea. All of the reasons for this murky release pattern are unclear but seem to have something to do with arguments between the director and the Weinstein Company, and may well become an unfortunate case study of the decline of theatrical release of films. “Snowpiercer” may well fall into the category of one of the best films you may never see, and what a shame if it does, because this is a big screen film if there ever was one. It’s winter here in Sydney, and the cinema I saw it in was running on the cold side in my mid-morning session (with just six other patrons), so I acutely felt the cold shown on screen – the only time I have felt this way before was when watching “The Day After Tomorrow” in the cinema some years ago. The plot, outlandish as it is: scientific attempts in 2014 to avert global warming have resulted in a catastrophic global cooling that has virtually killed off all living life. Picking up the story 17 years later in 2031, the only humans left are those on a high-tech train – invented by mastermind Wilford – that circles the globe. But the situation on the train reflects the worst sort of social engineering and fascist inequality, with severe deprivation and brutality visited on the masses in the last few cars, who are fed with gelatinous protein bars, kept in concentration camp-like conditions and occasionally recruited to do special jobs for the rich and spoiled elite who live, work and – especially – party in the front cars. As a special delight, the film presents a great mixture of white, Asian and brown faces, neatly capturing our “multicultural” present. The dirty masses dressed in rags are perpetually scheming about how to revolt, and when an opportunity arises they take it, led by Curtis (Evans), with the support of his grand master Gilliam (Hurt), attacking the ideologue “Minister Mason” (Swinton, in a role uncomfortably close to Margaret Thatcher at her worst). As Curtis and his supporters battle their way to the front, they meet one surprise after another: I won’t present any spoilers, because this is where “Snowpiercer” is simultaneously at its most wondrous and barbaric (those who fear gore, be warned). 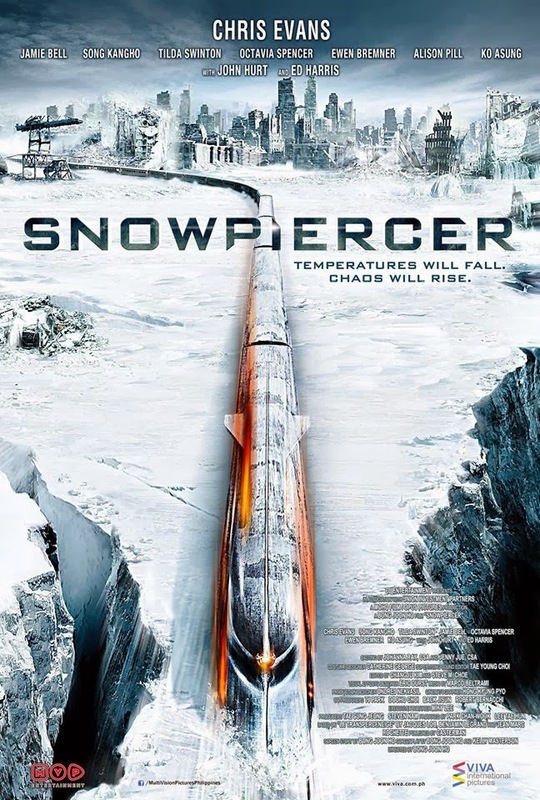 “Snowpiercer” is an achievement of major proportions. Sure, it liberally uses ideas presented by others on-screen, but does so in a way that is unique, riveting and ultimately very personal. Like the best of films, this one reflects our present anxious moment of both climate change and inequality of wealth (see authors such as Thomas Piketty and “Capital in the Twenty-First Century”) in exceptional and unexpected ways. In these days of hyper-active mainstream Hollywood film production, it’s relatively rare to find a film in which the concept exceeds the execution. However, “Ender’s Game” is just such a film. The original novel, by Orson Scott Card published in 1985, won both the Nebula and Hugo awards. Despite the violence in the novel (and more recent controversy about Orson Scott Card’s political views), the book has been well-received – including a notable listing on the “Professional Reading List” of the United States Marine Corps. The basic premise is that in order to repel an expected invasion of earth by alien “Formics” (called the “Buggers” in earlier versions of the novel), the International Fleet (all of earth’s armies have combined to battle aliens) has begun recruiting young people. In the book, it appears that the hero, Ender Wiggin is recruited at age ten. In the film, Ender is played by Asa Butterfield (“Hugo”, “The Boy in the Striped Pajamas”) and is much older: Butterfield was born in 1997, thus turned 15 during the film’s production. 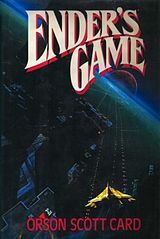 Orson Scott Card’s original concept – that the younger generation with its facility in video gaming that could be applied to actual battles – is not totally new: the 1983 film “War Games” dealt with related ideas in the Cold War era. But Card’s ideas of “understanding your enemy” as a means of battling them properly are particularly noteworthy. The film version includes at least four or five “understand your enemy” sequences, which surely are more detailed in the book. In the film, these come across as paler versions of the (albeit memorable) “The Force be with you” concept from “Star Wars”. “Ender’s Game” shows how Ender’s emotional maturity and his genuine insights into how to get others to do what he wants, brings him to a leadership position. Ultimately, he becomes leader of a space battle army, with attendant emotional complications way in excess of what a young teen can handle. I have pondered why “Ender’s Game” (the film) falls into the “good but not great” category; it appears to be receiving 3.5 stars out of 5 from most thoughtful reviewers (I would tend towards 3 out of 5, and do not think I am being too harsh). The filming is excellent – pretty much what we expect from sci-fi nowadays, although the images are nowhere as chilling as many scenes in the Tom Cruise vehicle “Oblivion” (also a 3.5 star film from many, but a 4 stars from me) or the superior “Elysium”. Despite the presence of movie stars – Harrison Ford and Ben Kingsley appear in interesting supporting roles, along with “almost” young female stars Hailee Steinfeld and Abigail Breslin – entrusting the film’s emotional carriage to Butterfield is tough. What 15year old male could pull this off? Ultimately my criticism of “Ender’s Game” is that I was left unmoved by the big issues that appeared to devastate Ender emotionally. Did we need more set-up (certainly), more characterisation (probably), better written scenes (possibly)? What was really at risk for Ender? It’s hard to create a strong emotional resonance for the issues in a young teen, and perhaps the young adult audience – at whom this film is really aimed – gets more involved in “Ender’s Game” than I do. There are some great concepts left undeveloped: deep issues such as personal responsibility, the greater good and how to make war applying true emotional intelligence. If two recent movies are any indication, there is a new movie paradigm emerging: the growth and spread of viruses. This by no means new – think Adromeda Strain (1971), Carriers (2009), Outbreak (1995), 28 Days Later (2002), Cabin Fever (2002), I Am Legend (2007) and Quarantine (2008). Contagion has topped the US box office and follows the release a short while ago Rise of the Planet of the Apes, which (ALERT: plot giveaway about to come – do not continue reading if you have not seen the film) ends with a fabulous sequence showing how humanity is about to die by a man-made virus that makes apes “super-human” and kills humans. We use killer virus movies to channel our worries about jobs, gas prices and the economy. But we’ve had some recent up close and personal brushes with pandemics–sure, they haven’t annihilated humanity, but people have died. That … makes it all the more real to moviegoers. It’s partly the “September 11th effect” (yet another indication of how that event has lodged itself in our subconscious in ways still being played out in the cultural realm) and partly the post-AIDS/HIV era (if it is possible to term it that way). I have rarely been so taken by a new television series as I am by FlashForward, the science fiction-style series which appears on Australia’s Channel 7 each Monday at 8.30pm. Click here to view the episodes in Australia; click here to view the episodes if you are in the USA. The USA appears to be running about five or six days ahead of Australia – so last Thursday’s episode in the USA (November 12) will appear in Australia on Monday November 16. The series appears to unfold in “real time” – that is, what we are watching each week supposedly is taking place during that time (Hallowe’en on that holiday, etc), all leading up to the April 2010 climax – the two-plus minutes of everyone’s future which everyone viewed in the first episode. The series is wonderfully written, setting up not only some great science fiction questions, but also some important ones about the nature of time: do we have free will? (the series appears to be saying “maybe yes”, but the word is not yet in) is the future ordained? (the BIG question, to be sure) are all of those people who did not have “flash forwards” really going to die before April 2010? (we are hoping not, as our Korean-American FBI agent – played by John Cho – will be among them). The premise, if you have missed this interesting event to date, is that everyone in the whole world lost consciousness at the same moments (causing all sorts of mayhem – planes and cars crashing, millions dead, etc) and glimpsed a vision of their future – all simultaneously. This in turn drives many people almost crazy, including one of our heroes, FBI agent Mark Benford (Joseph Fiennes), who is rather unhappily married and whose wife Olivia has seen a guy in her living room who she calls “darling” (the same guy who is the father of a young autistic boy she is treating). Fiennes, disappointingly, is not great in this role, and his marital strains are one of the least effective parts of the story (he and his wife’s flash forwards indicate rough times ahead). In a world where some 20+ million people have died in one moment, I think there would probably be more post-traumatic stress disorder (PTSD) going on, but my only real complaint about the writing is about their time zones. These writers – who get so many things absolutely right – have got one thing totally wrong: The mass consciousness loss took place about 10.00pm in Los Angeles, which would make it about 1.00am in Washington, DC – great, that one is right (showing the President being woken up in the middle of the night), but they got two wrong: there is a sideline story (episode 2?) in which they discuss and show a baseball stadium in what I am sure they said was Detroit, Michigan where there is one mysterious figure (and it’s a pretty creepy moment, which they show a number of times) moving through the huddled unconscious people – except it’s daytime. Duh (as they say). 10.00pm in LA makes it 1.00am in Detroit – thus no baseball game, no daylight. Oh boy. And then there is a long discussion about how very few Chinese died during the “flash forward” (and maybe they were therefore responsible), but then one character says “but it was the middle of the night there”. Well, no, it was not: 10.00pm in Los Angeles makes it 2.00pm (not am!) in Beijing – anything but the middle of the night. Despite these faults (wish they had not made the mistakes), one hell of a great series. Proyas directed one of my all-time favourite films – I, Robot – the first two-thirds of which are truly haunting, as well as some of the scenes towards the end (robots looking depressed and peering out of shipping containers – wow!). His other work includes Dark City and The Crow. Proyas is Australian and shot The Knowing in Melbourne – standing in for Boston (I have always know Melbourne was a good surrogate for Boston or Philadelphia, glad someone else worked this out too), and the film features a large number of Australian actors (Rose Byrne, D.G. Maloney, Ben Mendelsohn, the haunting Lara Robinson, Nadia Townsend) all playing Americans. For those who know downtown Melbourne, there are a number of street scenes where you can recognise landmarks – sometimes digitally altered. There is also a scene in front of the Victorian Parliament where the film-makers did not remove a Victorian train map (as it was supposed to be in New York at the time). The Knowing is set in Lexington, Massachusetts – it starts in 1959 with the laying of a time capsule that will be brought up 50 years later, and a young girl had written a whole page of numbers that our hero (Cage, doing his suitably mournful appearance – and boy does he have things to mourn – a dead wife, a kid who hears things, a depressing gray and brown house and the end of the world facing him) works out that the page is actually a whole chart of disasters which took – and will take – place. I have been to Lexington a number of times, and what a shame that the film did not make more use of this very historic town (one of the birthplaces of the American Revolution) just outside of Boston. It could just have easily been set in anysuburb USA, why Lexington? Next time, scriptwriters, make a good connection with historical meaning – perhaps this is where the Melbourne shoot did hinder the film?